Home » State of the Art vs. State-of-the-Art – What’s the Difference? Many college students buy expensive, state-of-the-art laptops when a cheaper machine would fill the same function and be much more practical. People seem to be drawn to the latest-and-greatest models of everything from computers to cell phones to vehicles. If you are a careful reader, you might notice that sometimes the phrase state-of-the-art is spelled with hyphens (as I did just now), and sometimes without hyphens, as state of the art. Are these phrases identical? After all, they contain exactly the same words in exactly the same order. How much difference can there be? In truth, adding hyphens in between the words changes the same phrase into a different part of speech. This adds some versatility to a clunky phrase, but it also sows confusion among unfamiliar readers. 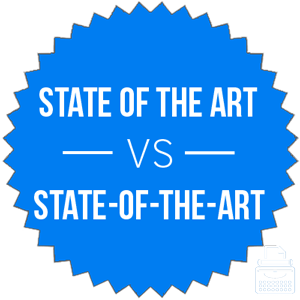 What is the Difference Between State of the Art and State-of-the-Art? In this post, I will compare state-of-the-art vs. state of the art. I will use each of these words in at least one example sentence, so you can see how they appear in context. I will also show you how to use a helpful memory tool that makes choosing state-of-the-art or state of the art much easier. What does state of the art mean? State of the art is a noun phrase. It means the highest point of technological achievement to date. Electronics salespeople have an unhealthy obsession with the state of the art. The architecture of the new buildings in the city were the state of the art in 1955. What does state-of-the-art meant? State-of-the-art is the adjective version of the same phrase. It describes the newest technological achievement in a given field. I bought a state-of-the-art coffeemaker, but it broke a week later and I returned it. Kerri spent $600 on state-of-the-art bicycle tires, and she only rides her bike in strictly controlled racing environments. Something that is state-of-the-art is modern, new, and usually very expensive. A professional basketball team might have a state-of-the-art practice facility, or a hospital might have a piece of state-of-the-art monitoring equipment. Another connotation to saying that something is ­state-of-the-art is the same as saying new and expensive. These phrases contain all the same words, but they are different parts of speech. State of the art is a noun phrase. In English, nouns can become adjectives through the process of hyphenation. Thus, the hyphenated state-of-the-art is an adjective phrase. State of the art is a noun phrase. State-of-the-art is an adjective phrase. It can be difficult to remember the difference between these phrases, since they contain the same words. State of the Art vs. State-of-the-Art Check: Since state-of-the-art is a hyphenated adjective phrase, like run-of-the-mill and over-the-top, you can remember these similar phrases as a reminder that state-of-the-art, too, is a hyphenated adjective phrase. Is it state of the art or state-of-the-art? You should only use the hyphenated version of this phrase as an adjective; the two spellings are not interchangeable. State of the art is a noun phrase that refers to something on the cutting edge of technology. State-of-the-art is the same phrase transformed into an adjective through hyphenation. 1 What is the Difference Between State of the Art and State-of-the-Art?